(Scroll down for video) A man didn’t want the bank to take control of his house that was due to be seized in a foreclosure, destroyed the entire home, according to reports. An Ohio man said he carried out his threat to tear down the house before allowing his bank to foreclose on the property. Terry Hoskins of Moscow said Riverhills Bank refused an offer of $170,000 to pay the money owed on the loan of $350,000, with officials saying it could make more money from a foreclosure sale, so he gave the bank an ultimatum of the final destination of his house, "I will tear it down before you can sell it," he said. "When I see I owe $160,000 on a home valued at $350,000, and someone decides they want to take it from me no, I was not going to stand for that, so I tore it down," Hoskins said. 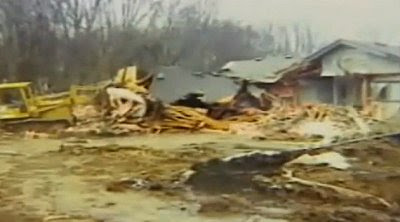 Hoskins said he used a bulldozer two weeks ago to raze the house he built for decades. "As for what the bank is going to get, I have the intention to restore what was on the hill exactly as it was," Hoskins said. "I pulled it out of the ground, and I am planning to put it back on the ground." Hoskins said he is also considering demolishing his business in Amelia, Ohio.